Jamaican singer-songwriter and producer Jah9 starts her Year of 9 (2+0+1+6) World Tour, spanning North America, Europe and Africa. Her North American portion kicked off this Sat. July 23 at the Northwest World Reggae Fest in Portland and in Seattle on Sunday. Jul 24. The cross-continent run continues in Vancouver, Philadelphia, New York City, Rochester, Ithaca, Toronto and Denver and closes at Cali’s renowned Reggae On The River festival in Humboldt County. Europe and Africa dates follow. See full tour schedule below. Today on the road, Jah9 drops 9mm Vol. 2: Pre-Album Groundings, a thought-provoking and intentional mix of originality and inspiration to gear up for her highly-anticipated sophomore album 9, out 9/9 on VP Records/Steam Chalice Records and available for pre-order now. With Jah9’s lioness lyrical dexterity and soulful rich production, her authentic spirit shines on Vol. 2. Her latest offering features original, never-before-heard music including “Unafraid” (a standout track from her upcoming album addressing child molestation) and pays homage to some of Jah9’s greatest influences, both spiritually and musically. She incorporates empowering speeches from Haile Selassie I, Ra Un Nefer Amen & Drunvalo Melcheziek, encouraging her listeners not only to journey into higher levels of consciousness, but seek out information and knowledge. She also celebrates some of her most beloved musical inspirations with one-of-a-kind covers of Nina Simone’s “Misunderstood” Tracy Chapman’s “She’s Got A Ticket,” Ras Micheal’s “New Name,” Dennis Brown’s “Blood City” and an invigorating medley of Sizzla Kalonji. The 18-track selection features original production from Jah9 and live instrumentation from her band The Dub Treatment including Sheldon Bernard, Janoy Ellis, Omar “Jalanzo” Johnson, Aeion Hoillet, Andrew “Chako” Edwards & Fanso Craig. The collection is mixed & dubbed by Hasani ‘Snysh’ Williams. This part two installment follows Jah9’s 2012 9mm Vol 1: Message Music, a precursor to her debut New Name. 9mm Vol. 2: Pre-Album Groundings is an introduction of what’s to come on 9 | 9 | 2 + 0 + 1 + 6 = 9. Her self-produced sophomore album 9 is a combination of intellectual rigor, real world activism and lyrical musicality. The album’s first single “Humble Mi,” also featured on 9mm Vol 2., is available now. For those who’ve been waiting for Rasta consciousness to mount a resurgence in contemporary reggae, Jah9 is a figure of revelation. She first caught the attention of many with a string of singles including “Avocado,” “Steamers A Bubble,” “Jungle” and “Gratitude,” The singer-songwriter and producer boasts a soul and jazz inflected melodicism and possesses a fiery vigor in her dynamic live shows. Jah9 is also university graduate, a multidisciplinary yoga instructor, a youth at risk counselor and a celebrated poet. Certain to be one of 2016’s most celebrated releases, the new album Everlasting signifies a milestone in Raging Fyah‘s career by raising the bar on their already lofty musical standards. Preview the feature single ‘Ready For Love‘ now. Order the Everlasting album NOW. I noticed the recent uproar caused by, and massive publicity being given to Billboard Magazine, who announced their best of 2015 recently. The initial blip that came on my radar was a Jamaica Observer article, but since then I have seen many of my peers in the reggae industry, especially those representing Jamaica, sounding off and voicing their disapproval of Billboard as if this was an objective award selection. By simply visiting Billboard’s website and reviewing the rankings I saw that what happened in 2015 – a non-Jamaican crowned Artist of the Year – also happened in 2014, 2013, and so on and so forth. No one slammed the magazine when California-based reggae group Rebelution, Israel’s Matisyahu, or American rappers NAS and Snoop Lion were crowned. If anything, Jamaican reggae artists, supporters, and the media alike should be reporting that 2015 was the best year in recent history for Jamaican reggae acts as evidenced by releases from Morgan Heritage, Protoje, Jah Cure, and Kymani Marley all selling well enough to be on the 2015 Reggae Album charts. 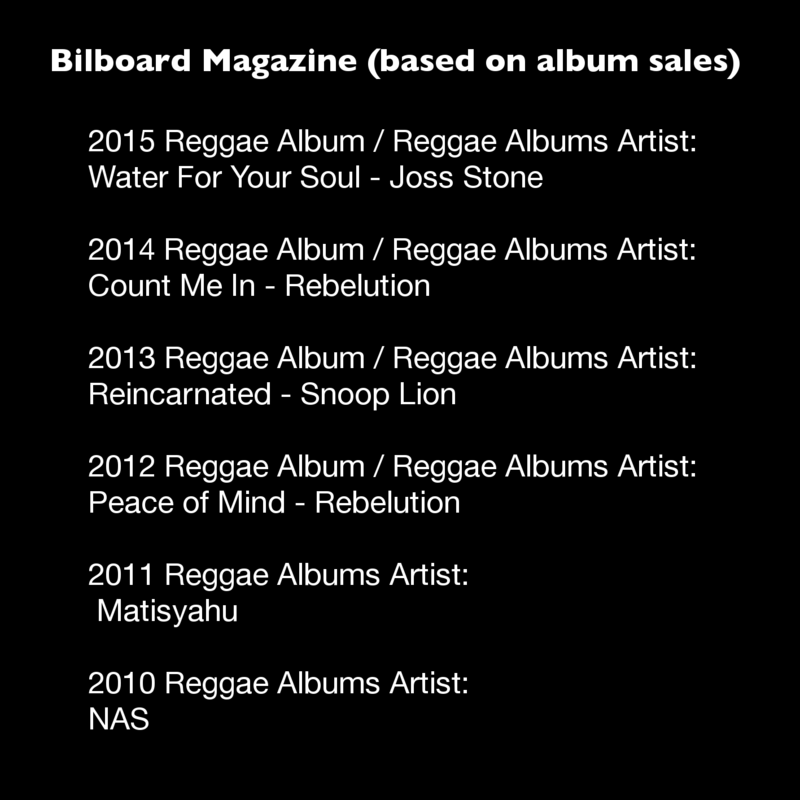 Yes, Joss Stone (UK) sold more, but in prior years only the Marley name could be found consistently among the top selling reggae albums reported by Billboard. Congratulations to the aforementioned artists carrying the reggae banner in 2015. How can we continue this resurgence of Jamaican reggae and secure a place for artists from the genre’s homeland on international music charts, and concert stages? Start by putting your money where your mouth is. Vote for the artist you love by buying their album.